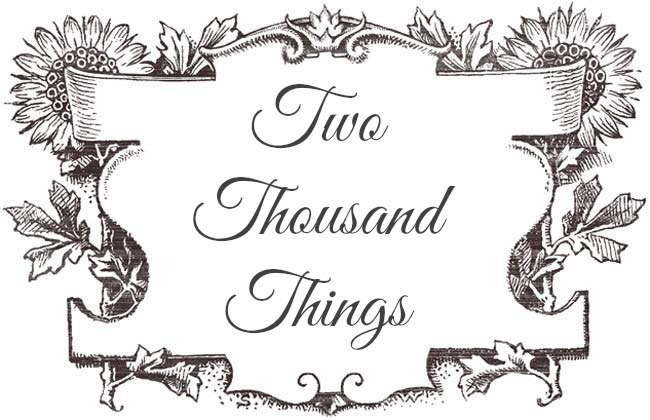 from now on will be known as Duke & Duchess of Cambridge. 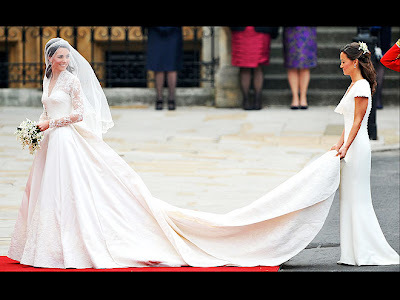 Kate chose a simple, elegant and very pretty white silk and lace wedding gown with a style almost similar to what Grace Kelly wore on her wedding day to the King of Monaco. The full lace at the top and the torso-length veil is similar. 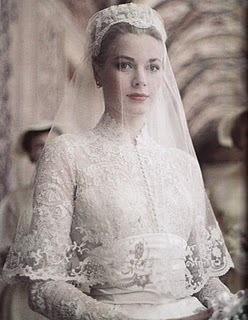 But who doesn't want her wedding dress as graceful as Grace Kelly's, right? Grace Kelly on her wedding day. See the resemblance? 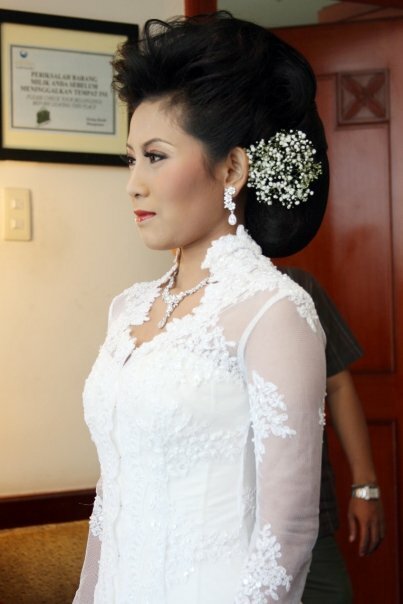 The lace on top, long sleeve and the torso-length veil with tiara. I think Kate's dress is really beautiful and I can even see her as Queen in that royal ceremony. She does have a certain royal aura and with that tiara on her head she really looked like a Queen (anyone agree with me?). 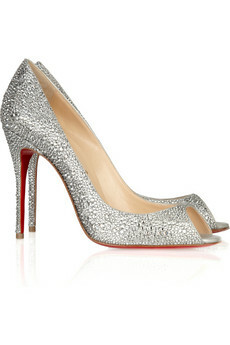 The dress is perfect for a great occasion like that, it made me wonder what would I wear if I were in Kate's shoes? hahaha Dreamy much? I am married now and the custom in my country (based on certain nationality and religion) is to wear a national costume called "Kebaya". It's made of lace and we usually wear Batik as skirts, but not an ordinary Batik, it's a royal Batik embellished with gold threads and sometimes added with lace so it looked like a royal skirt. So no white wedding gowns for me. Now being the daydreamer I am, I imagine what would my white wedding gown would be. Well, first I think I would not prefer the strapless ones because I don't know, I just don't like the ones with straps or covered shoulders better. I love this tiered whole-silk-lace skirt on the dress, plus that sweetheart neckline and that sheer veil/shawl = awesomeness! So anyway, if you were Kate, what would you wear in your big royal wedding? I myself would prefer something worth to talk about, like maybe this gorgeous Cabaret wedding gown from Ian Stuart? 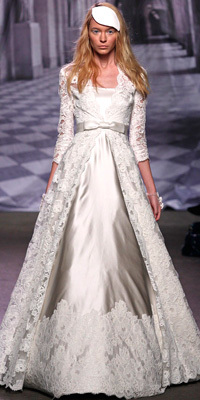 A few of wedding gown designers that I love are: Monique Lhuillier, Marchesa (who designed Nicole Richie's wedding gown! ), Claire Pettibone, Jenny Packham, and a British designer Ian Stuart. 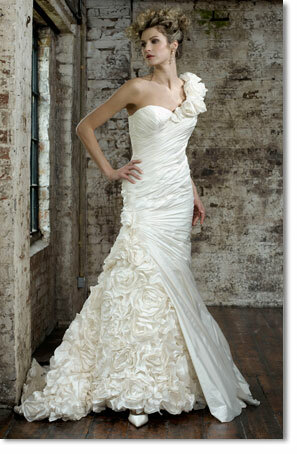 I love Ian Stuart wedding gown collections, they are all so dreamy and gorgeous with the finest textile you could get. Above pic is one of his collection, isn't it gorgeous? It's perfect for a royal celebration. The stunning gown is beaded with sequins and crystals throughout. It features a one shoulder strap, covered in silk flowers. The back bodice has a lace up corset, and the front has asymetric skirt drape that reveals another blooms of handmade silk flowers! And while I was browsing Ian Stuart website I found a gorgeous dress with the name "Tiger Lily" !! What? 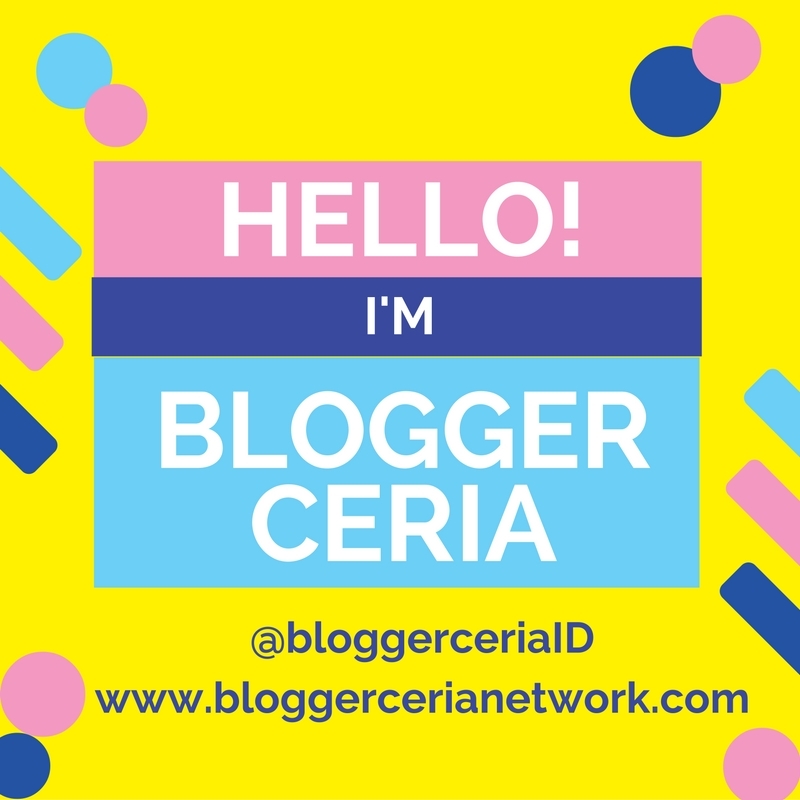 That is my screen name, it always been my screen name ever since I first met the internet more than 10yrs ago. So of course I have to look at the dress! It turns out to be a gorgeous dress with a hint of oriental inspiration which I love very much! It's grey/silver with white lace, but if you read my last post, you'd know by now that all the royal brides used to wear silver/gold wedding gowns before Queen Victoria choose white and then all the world copied her. This grey/silver and white gown screams opulent. It has a long coat style which makes it unique. And it's a ballgown shape too which I think is a must shape for a royal wedding gown. What about the maid of honor dress? The 2nd pic is a pretty dress from Jenny Packham. 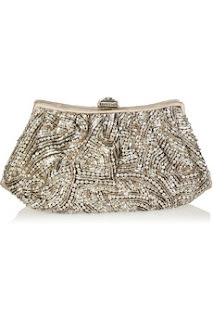 It has simple shape but adorned with elegant looking rich embellishment on the neckline up to the back and torso. What do you think of those choices above? Or if the bride prefer a more simpler shape then how bout this elegant looking gown in lavender? This taffeta suede dress is also from Ian Stuart collection. It has a ballgown shape with not-so-deep v-neck and subtle pleats on the skirt. What makes this dress special is the hand dyed flower corsage on the shoulder that adds a modern feature to this classic timeless gown. An elegant lavender dress + blazer style that would correspond to the royal wedding dress code which is: uniform, morning coat, or lounge suit. Or maybe a sequined silk dress like this one below from Jenny Packham? The hairpiece is also very pretty. 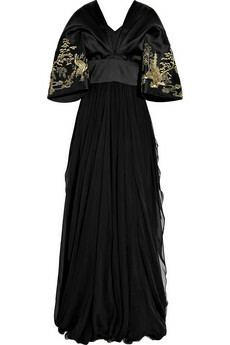 Or maybe the bride would choose something more regal like this dark beauty one from Alexander McQueen? Now this dress is everything a princess wants to wear in her wedding day. Look at that big ballgown shape, almost like a dress worn by Marie Antoinette, don't you think? This dress called Dauphine is (again) from Ian Stuart collection. 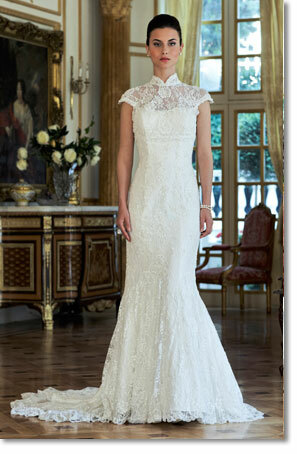 Made from exquisitely beaded french lace with lavishly draped side panels with tiers and delicate flower corsages. 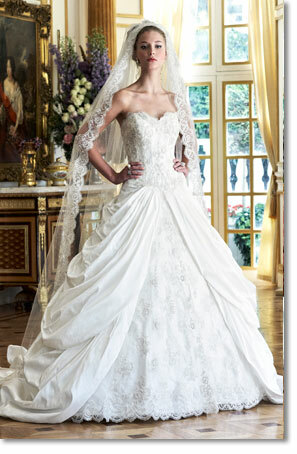 There's even a matching beaded lace trim veil to complete the look! I now pronounced this as the ultimate royal wedding dress! 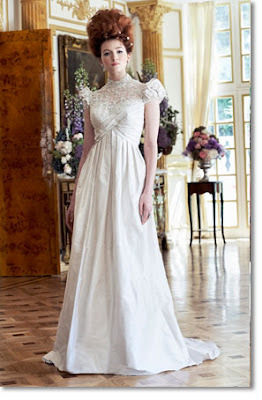 This beautiful dress is from Claire Pettibone. I love the simple shape and the covered shoulder because hey, it's a royal wedding we're talking about here so no overly exposed cleavage please ^o^ I also love the hairstyle in this one. 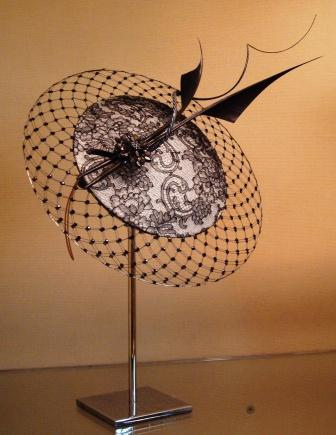 Gorgeous morning dress, perfect hat (because it's a British wedding, remember? 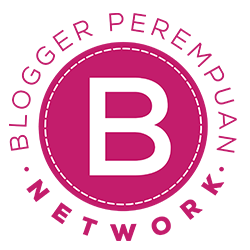 ), and gorgeous color too. 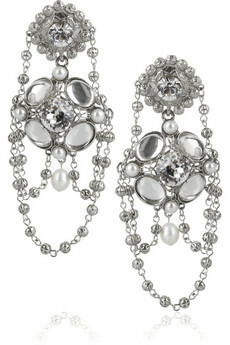 With the right jewelry such as the dangling golden earrings in this pic would make it even more perfect. What about the bridesmaid dresses? 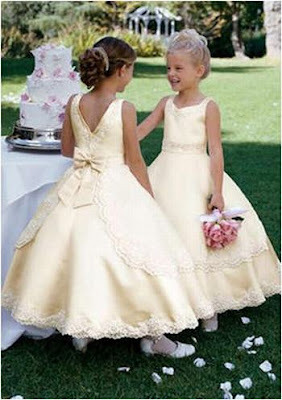 Well how bout these cute pale yellow satin dresses with pretty lace detailing at the hem and cute bow at the back? This looks elegant, beautiful and "royal enough" for reception party. This is actually a top and a strapless gown. The sheer tulle top with silver bead and crystal embellishment is from Alberta Ferretti while the strapless gown is from Gucci. 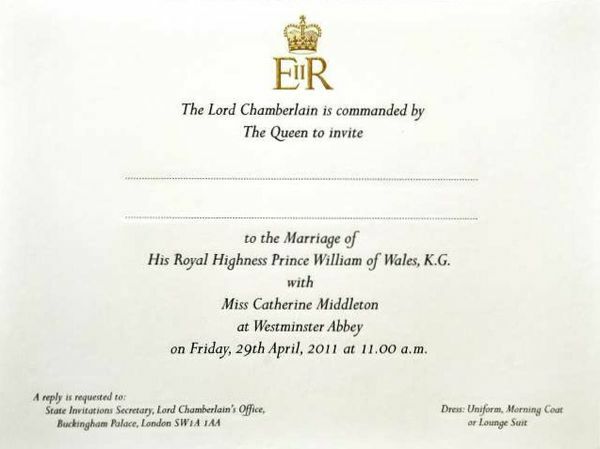 The Royal Wedding Invitation. Dress code is on the right bottom corner. Dresscode: Uniform, Morning Coat, Lounge Suit. Now what is a morning suit? according to Wikipedia, "Morning dress is the daytime formal dress code, consisting chiefly for men of a morning coat, waistcoat, and striped trousers, and an appropriate dress for women." a Valentino leather-trimmed lace dress. And maybe with this hat? P.S. : You look really stunning in your dress too! But I don't think I'll be getting married anytime soon. Haha.